We will try to have a Classmate's Biography each month! Manitou Bank went bankrupt in either 1925 or 1926. Donald Dean, Donald Martin, and Donald Wells. 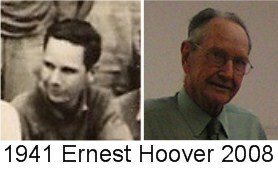 in farming, but was called to service toward the end of World War II. Eddie simply thanked the group and walked away. aunt, Lillie Todd, one half mile east of Manitou on the Baseline Road. covered the areas northwest and northeast of Manitou. of 1969), Steven (Class of 1974), and Roger (Class of 1978). 1954), and Louella (Class of 1957). Holton School (six and a half miles east and one mile south of Manitou). high school at Manitou, graduating with the Class of 1948. Clayton Hughes, and Thomas Tuck. 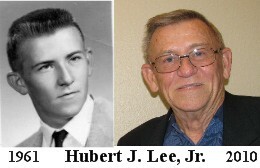 Biography of Hubert J. Lee, Jr.
Born: 17 March 1943 to Hubert Lee, Sr. and Lula (Hawkins) Lee, raised by grandmother Mrs. Lona Clementine Hawkins. We moved to Manitou in 1953 from Snyder. I attended Snyder Elementary School between 1949 and 1953, then Manitou School from 1954 until graduation in 1961. I have fond memories of playing in the park at Manitou, as well as meeting with friends at Studer's cafe and playing pinball and listening to the juke box. Dragging main in Frederick and Snyder was the thing to do on Saturday & Sunday (after church of course). I loved playing basketball and baseball for the school and received best athlete award my senior year. I was fortunate to deliver the salutatorian address at our high school graduation. I remember the small town environment with everyone attending each ball game, Parent Teachers Association (PTA) meetings and plays. The school and church were always the center for families. Where else would a superintendent take in a 17 year-old and ensure he finished high school. Mr. Brookman, and his wife Betty, did that for me after my grandmother became sick and had to enter a nursing home. I left Manitou immediately after graduation and visited with family members until February 1962 when I joined the Navy. I spent 24 years in the Navy (retiring in 1986) and retired as a Chief Hospital Corpsman. I specialized in Pharmacy while in the Navy and served in a number of locations around the world. Duty Stations included San Diego, California; Guam; the U.S.S. Repose off the waters of the Republic of Vietnam; Washington D.C.; Virginia Beach, Virginia; Puerto Rico; and the U.S.S. Iwo Jima. After retiring in 1986, I pursued the pharmacy career field. I served as General Manager for four Long-Term Pharmacies until I retired for good in 2005. I married Karen Gleason, from Watkins Glen, New York, and we’ve been together 30 years and have one son, Eric. We live in Franklin, Indiana, and I served as president of the PTA for several years and coached my son’s baseball, football, and basketball teams. After retirement in 2005, I stay busy with working as a civilian on the battlefield at Camp Atterbury in Indiana. I also am a competitive bowler, winning many tournaments and leagues over the years. I am a Vietnam veteran and right now I’m fighting another battle with multiple myeloma caused by Agent Orange. I want to say publicly that I am not angry with this as I got 40 years more than of my peers. One of the highlights for me was attending the 2010 Manitou reunion and seeing classmates and schoolmates for the first time in 50 years. Go EAGLES!!! !